The RD Series from Carson are lightweight open-bridge waterproof binoculars that boast a high definition and crystal clear image quality. The RD Series comes available in multiple compact and full-sized models ranging from 8x26mm (RD-826), 10x34mm (RD-034), 8x42mm (RD-842), 10x42mm (RD-034) and 10x50mm (RD-050). All versions of the RD Series binoculars are nitrogen filled and o-ring sealed making them both waterproof and fogproof. They all contain BAK-4 prisms ensuring super sharp and ultra precise images. The 8x26mm (RD-826) and 10x34mm (RD-034) contain multi-coated glass optics while the 8x42mm (RD-842), 10x42mm (RD-034) and 10x50mm (RD-050) are fully multi-coated. Weighing less than a pound, the 8x26mm (RD-826) and 10x34mm (RD-034) are the more compact sizes of the RD Series making them easier to travel with and more ideal for hiking, backpacking, birding and travel. 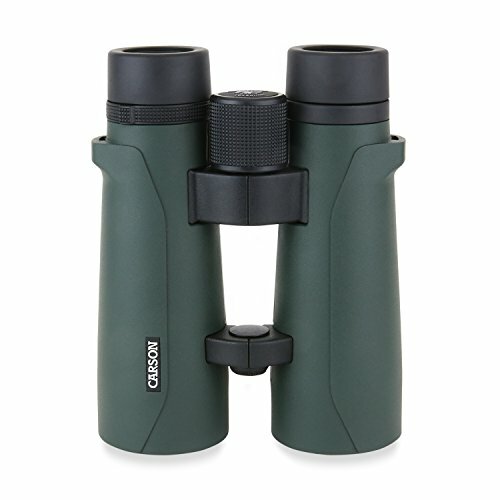 The 8x42mm (RD-842), 10x42mm (RD-034) and 10x50mm (RD-050) are the full-sized models making them great for numerous activities ranging from bird watching, hunting, sight-seeing, astronomy, surveillance, safaris and more. All RD Series binocular models are tripod mountable and come included with a hard case, lens covers, neck strap and a microfiber lens cloth. At Carson, we manufacture only the highest quality binoculars. We’re so confident in our products that we back them with our No-Fault, No-Hassle Warranty. In the event that your binoculars get damaged, regardless of cause, Carson will repair or replace them at no charge. If your binoculars are found to have manufacturing defects in materials or workmanship, Carson will repair or replace your binoculars and return them.